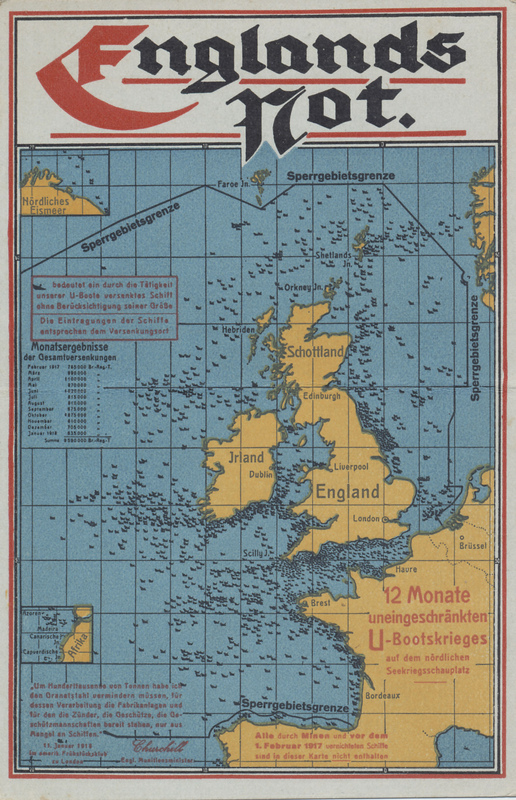 England's Distress: Postcard map of England and Ireland with the restricted zone Germany proclaimed around the islands, showing the ships destroyed by submarine in the 12 months beginning February 1, 1917. Alle durch Minen und vor dem 1. 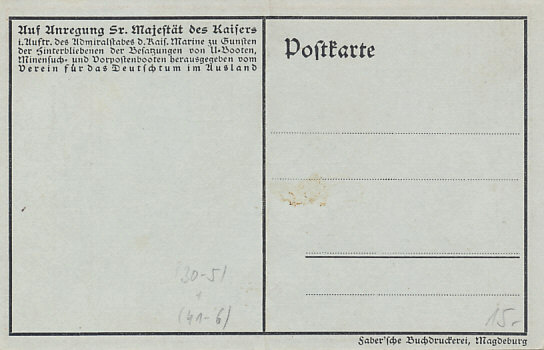 Februar 1917 vernichteten Schiffe sind in dieser Karte nicht enthalten. Die Eintragungen der Schiffe entsprechen dem Versunkungsort. 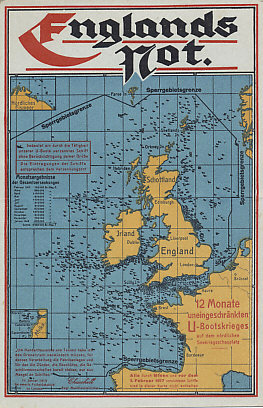 All ships destroyed by mines of before February 1, 1917 are not included in this map. [Sunken ship symbol] indicates a ship sunk by the actions of our submarines without taking into account the size of the vessel. The records correspond to the ships' place of operations. International law required that non-military enemy ships be boarded and searched before seizure or sinking, actions that required submarines to surface, putting them at risk. German submarines began sinking shipping around the British Isles in 1914. Great Britain declared the entire North Sea a military zone effective November 5, and imposed its blockade of Germany. On February 4, 1915, Germany announced a campaign of unrestricted submarine warfare in which all ships of Britain and its allies were subject to sinking without notice. Chancellor Bethmann Hollweg opposed the campaign, believing it would bring America into the war. The United States and Italy objected, but the campaign began February 18. Germany accused Britain of false-flagging its merchant ships with those of neutral nations, and of arming merchant ships. On May 7, 1915, German submarine U-20 sank the passenger liner Lusitania. 1,195 civilians died, including 128 Americans. Responding to American protests, Germany restricted, but did not end, its campaign at the end of August. At a conference at Pless in September 1916, Germany again decided on unrestricted submarine warfare, with no warning given. The goal was to starve Britain by sinking 1,000,000 tonnes of shipping each month. 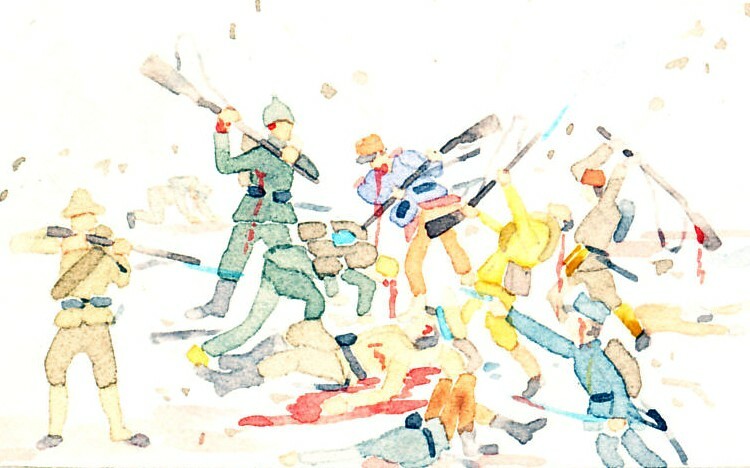 Again, Bethmann Hollweg and others cautioned the campaign risked bringing America into the war. The new campaign began on February 1, 1917. The campaign approached its targets, but peaked in April. British Prime Minister Lloyd George forced his navy to adopt the convoy system which provided an effective defense. President Wilson asked Congress for permission to arm merchant ships on February 26. On April 6, the United States declared war on Germany. One goal of the Third Battle of Ypres, was the capture of the submarine base at Ostend. On October 17, 1918, Germany ended unrestricted submarine warfare.